RancherMan & I don’t eat lots of sweets but every now & then he wants something sweet after supper. Good thing I have my very own homemade convenience food – home-canned apple pie filling. And this dessert doesn’t create a lot of landfill trash, almost everything is reusable and homemade. Plus this is a very inexpensive dessert and quick enough for unexpected company too! A family member allowed me to pick some of the amazingly-sweet apples off of her tree several months ago and I went to work cooking and canning them – I have several jars of pre-made apple pie filling in the pantry just waiting for inspiration, then inspiration hit! I took some graham crackers that were in our pantry and crumbled them into the bottom of these small microwavable dessert dishes, almost like a graham-cracker crust without the butter/sugar. These apples were certainly sweet enough not to need any help in the sweetness department! 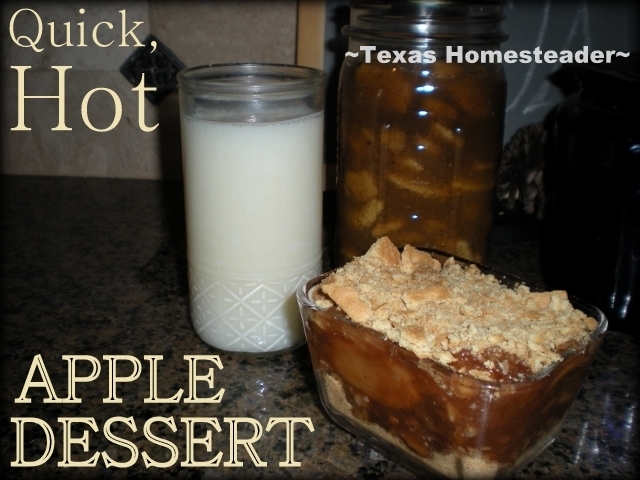 This entry was posted in Blog Posts and tagged Cooking, Environment, Food Preservation, Frugality, Make-It-Yourself, Recipes on January 17, 2014 by Texas Homesteader. I love using my canned fruit for desserts. It makes quick meals so much more fulfilling. My name is Katie and I host Inspired Weekends. All entries get pinned. I would love to have you link up! This week’s round is still open! My favorite TMR! Fast and easy 🙂 Thank you for sharing this at the party this week! I am featuring it on my Facebook page and have pinned it to the You’re Gonna Love Tuesday board on Pinterest 🙂 Have an awesome weekend friend!! Yum! I love all things apple. I should totally do this. I’m stopping by from the blog hop and I’m a new follower through Pinterest, Twitter, & Facebook. Oh – how I love pie! Did you see that movie with John Travolta called “Michael”? He was an angel who smoked and drank. Anyhow, one of the other characters in the movie – can’t remember her name now – made the cutest song about loving pie! That’s me! I looked on your search to see if there was a post on how you can your apple pie filling and didn’t see one. Do you use cornstarch when you can your apples? Thanks for this fun and easy recipe! I definitely love a shortcut. This looks delicious! Thanks for linking to the In and Out of the Kitchen Link Party. Hope to see you next week. That is so easy, I love how you do a lot of canning. My sister and I preserve jams , pickle relish etc… It comes in handy when prices are through the roof at the grocery store. Thank you for joining us on our Four Seasons Blog Hop. Pinning Now. What a great idea! Easy, quick and good on the environment?! I’m in! Thanks for linking up to the Happiness is Homemade party! That looks pretty good! I can’t seem to keep apples around here though. As soon we we get them I dehydrate them and then they are gobbled up. I’d love to find someone who has an apple tree but doesn’t need all of them. That would be a great find. You’re quite lucky. How yummy this looks and easy to boot!